Tech toys are no longer just for kids; they’ve become a family activity. Though STEM toys like Lego Mindstorms have been around for years, more and more brands are looking to encourage the next wave of youngsters to become interested in technology. 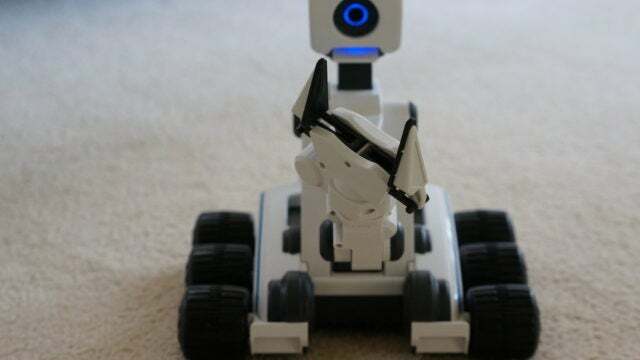 Mebo, a WiFi-connected, app-controlled robot with a 5-axis arm is one such toy designed to inspire kids to become interested in robotics. It just so happens that Mebo is a lot of fun to play with, regardless of age, making it both a great gift and indirectly a learning experience. Over the course of a month we used Mebo around our home, attempted a short-road trip outside, and bugged our two test dogs. Easy to use and simple to setup, Mebo is a fun and interactive robot for kids 8 and older (and adult-sized kids). Essentially, Mebo is a large, 5-axis controlled claw attached to six wheels and an HD camera. Through WiFi, Mebo is then paired with your phone to fully control him as long as there is an active connection. We were able to test using him onsite, and each time had no issues connecting to him. In the future, Mebo should be able to support cloud connection, giving you access to him from anywhere. Unfortunately, Mebo also suffers from a bit of lag, so as you attempt to control him (see our test videos), you’ll notice some stuttering in order to get the claw positioned properly. Once you get a hang of how he works through, motion gets a bit smoother. Mebo features a 720p camera that allows you to stream in both HD and record what is being seen. You can also take photos, but all of the media is stored within the app library and must be exported. Besides streaming and recording video, you can also speak or hear through Mebo. With a built in mic hidden under the camera area, you’ll be able to hear what’s going on around it. However, if you are nearby, you’re likely to create an echo effect until you turn it off. There is also a library of sound effects to make Mebo even more fun. Included with Mebo is a rechargeable battery and associated cord. We did not thoroughly test the battery, but were able to use him for about an hour straight without issue. For connectivity, Mebo uses IEEE 802.1b, and the general specs come in at 16.75 x 16.75 x 9.25 and weighs 4.25 pounds. For controlling Mebo, you’ll either need an iOS or Android based smartphone or tablet. 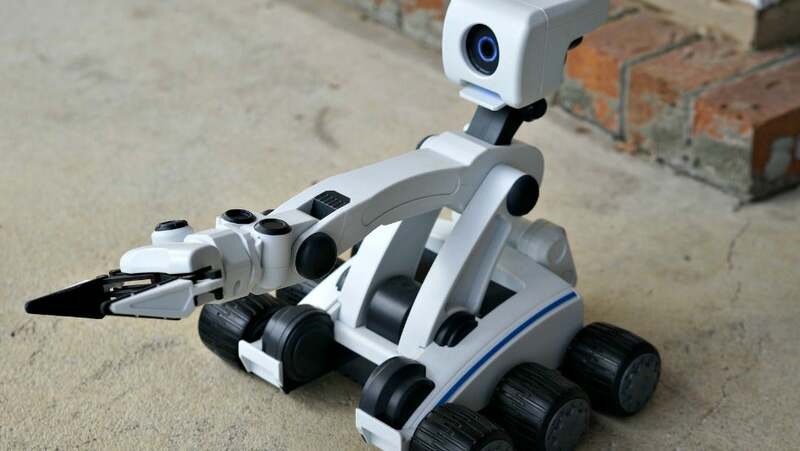 Mebo looks like a kid friendly version of what you’d expect the Mars rover to look like. With an off white plastic, black trim, and a blue LED ring for an eye, it produces a friendly perception. When it gets down to business, the six wheels make it easy for him to get around, while being durable enough to bang into things. Don’t plan on taking him out in grass though as he gets stuck relatively easily. Between carpet and hardwood, he does a great job getting around. As Mebo is essentially a moving claw, the majority of the focus lies within this feature. The claw is powered on five-axis’, giving you a great deal of flexibility and motion for grabbing things. Being a kids toy, we put on our imagination hat to terrorize Mebo a bit to see how much it could handle. Thanks to the hard plastic design and six wheel set, he does a pretty good job at getting knocked around and even going down a few flights of stairs. As far as how much he can lift, it’ll be obvious when he’s maxed out, which is at about 8-12 ounces. The only real downside of the design comes from it’s alert sounds. More specifically, the alert sound and constant blinking that it makes when recording video. It can become rather annoying quickly, but fortunately Mebo doesn’t record audio, so the sound will be left off. The connected app on the other hand is super easy to use, with a few basic options featured. Within the control view things get a bit more complex, but should be easily picked up by any kid that has ever played any kind of racing game. It’s a similar control scheme. Unless both you and Mebo are connected though, you won’t be able to access your recorded videos or images. If you have a regular sized iPhone though, you may have some difficulties pressing the buttons as there are a lot of controls to choose from. Overall Mebo is designed to look like a friendly robot with a hardshell to take what kids will no doubt put him through. Should you buy Mebo? If you’re looking for the next fun, interactive IoT toy, Mebo is it. He’s durable, fun, and a creative outlet designed to encourage kids to find an interest in robotics. For adults, Mebo will be just as fun to play around with, and I can even see him being a decent way of keeping an eye on your pets while out of the house. Our test dog (Gizmo) had no issue eating treats from its claw. We give Mebo a solid 4 out of 5 for it’s affordability, interactive fun, and easy of use.